There’s a shipment of extension tubes on its way from B&H Photo in New York City to my home at the Town and Village. And tonight, I’m pit-stopping at Jo-Ann Fabrics to find some black velvet or black fleece fabric. Last week, I captured snowflakes from an early morning snowstorm. The snowflakes landed on a cold black T-shirt and on a dark blue bath towel. I used a macro lens and a ring flash to capture the sparkly little guys in all their hexagonic glory. But I know these photos aren’t good enough for competition. To get the snowflake to light up, I flashed it with a ring flash. A ring flash is a light that encircles my camera lens. If I used a ring flash with a human model in a portrait shot, you could see little white circles in the model’s eyes in the finished photo. A ring flash offers a more even distribution of light throughout the photograph. And there’s no screw-on adapter for the Mitakon Zonghi. Nertz. 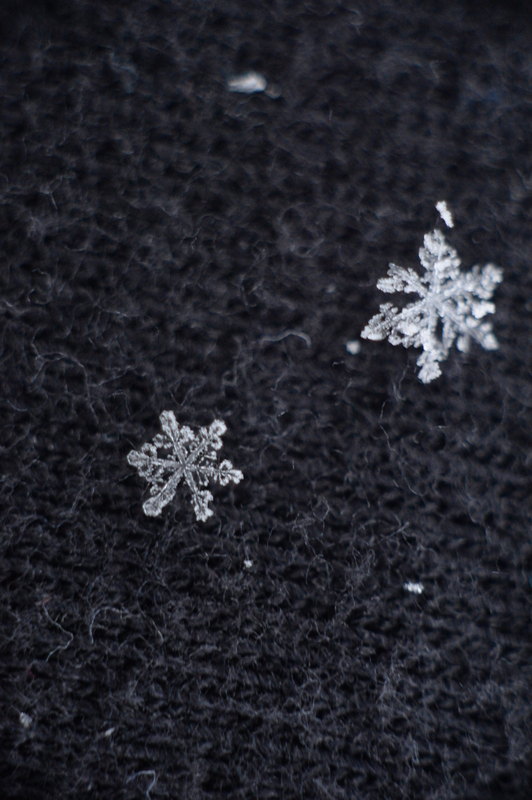 But if you can see on the example I’ve provided, the snowflake has very soft, out-of-focus stems. This may be how they might appear in the world, but it’s not as appealing in a photograph. To make sure I capture these snowflakes as sharply as possible, I either have to open up my f-stop (which, when I shot that flake, was an open-wide f/3.5), or I have to focus stack the picture. And I’ve never focus stacked photos before. Focus stacking is when you take several photos from various distances, then use a computer program to find the sharpest edges in all the photos and combine everything together as one image. Focus stacking is often used in landscape photography, where you want ot get the horizon mountains and the close-up goldenrods as tack-sharp as possible. That snowflake up there’s not tack-sharp. It’s more dull nail-sharp. My camera already has three Vello-brand extension tubes between the camera body and the camera lens. Extension tubes actually allow the photographer to capture subjects in larger frame without putting the lens right on top of the subject. But that being said …. Here’s the uncropped, unedited version of that photo. 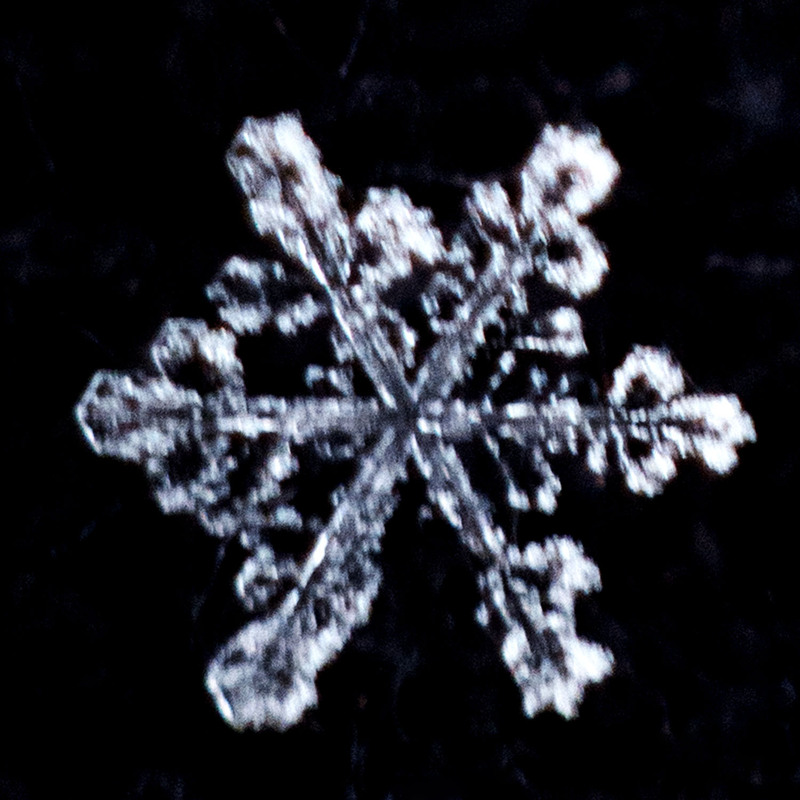 Even with a macro lens, and even with three extension tubes, that snowflake is still a small piece of that photo. Three extension tubes aren’t enough. Cropping the picture down would certainly give me a usable photo for a blog post, but not a Competition Season photo. Not unless I could enter a show where the printed photo dimensions are two inches by two inches. And as you can see … smooth black T-shirts are neither smooth nor black when magnified. I’m taking the suggestion from one of my blog readers and acquiring some black velvet as a base for future snowflakes. No, not that Black Velvet. No, not THAT Black Velvet, either. Not THAT Black Velvet, either. I gotta fix this “name a song and the YouTube clip pops up” blog app. This morning, I looked outside. There’s snow on the car windshields, but nothing floating in the skies. But the Weather Channel says that the Town and Village are due for a few more snow squalls in the next two weeks. In other words … I still have a chance to pull this off. And those of you who have followed my photographic journeys – through splitfilm and polar panoramas and infrared and sprocket and lenticular photography – you all know that once I get an idea and how I want it to appear… I do not give up until I have achieved success. I have a chance. And there’s snow in the forecast. Seriously. Let’s make this happen. Wish this idea had happened at the start of winter! But it’s not too late here in the northeast. I am confident that you will get your chance, and that you will succeed. We have to get through March before we can think seriously about spring. I’m looking forward to seeing your results.